Originally published in The Brooklyn Rail, May 2011. Images courtesy of Scott Hocking. When Diego Rivera and Frida Kahlo lived and worked in Detroit in the early 1930s, Rivera lauded the city as an example of, “the great saga of the machine and of steel.” Kahlo, in contrast, described it as “a shabby old village.”* A similar discussion—is Detroit the shining future or destitute— continues today, some 80 years later. Recent books and projects highlight its negative features (abandonment, segregation, crime); various media commentators single it out as an example of failed capitalism, democratic rule, and, if not exactly said, certainly implied, a failed, black-led city. Other ventures indicate a growing enthusiasm for Detroit and an opinion that the region, with its growing number of businesses, international population, organic gardens, and percolating art scene, is a promising example of a new kind of urbanity. The most interesting undertakings fall somewhere in-between these two views. They chronicle the city’s complex, lesser known stories; the nuances of its social and physical landscape and postindustrial status. 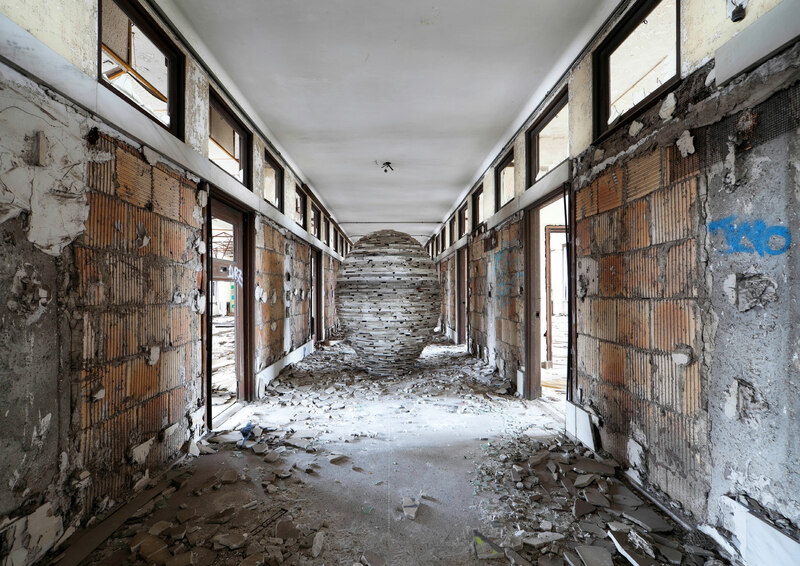 It is in this context to consider the work of Detroit based artist, Scott Hocking, who for the past 15 years has paid close, careful attention to the intricate and unique features of various, mostly neglected, global locations. Hocking works for periods of time in unpeopled, untended-to, often vacated and remote areas, developing an intimacy with his scenes that allows the artist to give a respectful nod to the past as well as suggest fresh, disparate, and creative narratives for the present and future. Locations include: the abandoned corridors of industry in St. Louis, the scrub jungles of Florida, neighborhoods in and around Shanghai, the fields and coastline of Northern Iceland, the Australian brush, and most especially, his hometown, Detroit. Hocking, like the best gumshoe reporter or beat cop, prowls his circuit with an impressive, fearless thoroughness. He possesses a detective’s stamina and eye for detail—an ear to the ground style that authentically connects him to his subjects. He collects found material from his chosen sites (rubber gloves in St. Louis, television sets from the fields of Detroit, bricks in an abandoned flour factory in Shanghai) to fabricate stunning sculptures and installations, which he then documents with photographs. Because the work is often erected in buildings that are slated for demolition or on sites that will decompose, be washed or blown away over time, his constructions would otherwise never be viewed. He is possibly best known for his photograph, taken in the abandoned “Fisher Body Plant #21” and published in Time magazine, of a pyramid he made of 6,201 wooden floor tiles that look like bricks (see Fig. 2, 15). His current show, Tartarus (the space in Greek mythology between Chaos and Hades), explores Detroit’s environment and the city residents’ immediate relationship to it. Hocking packs the Public Pool, a gallery space in a city neighborhood, with artfully arranged trash (see Fig. 19). The exhibition started as a cleanup project in Hocking’s Detroit neighborhood. As spring came and snow melted, the artist began to pick up garbage wedged in the dead vegetation of his parking lot, yard, and neighboring fences. 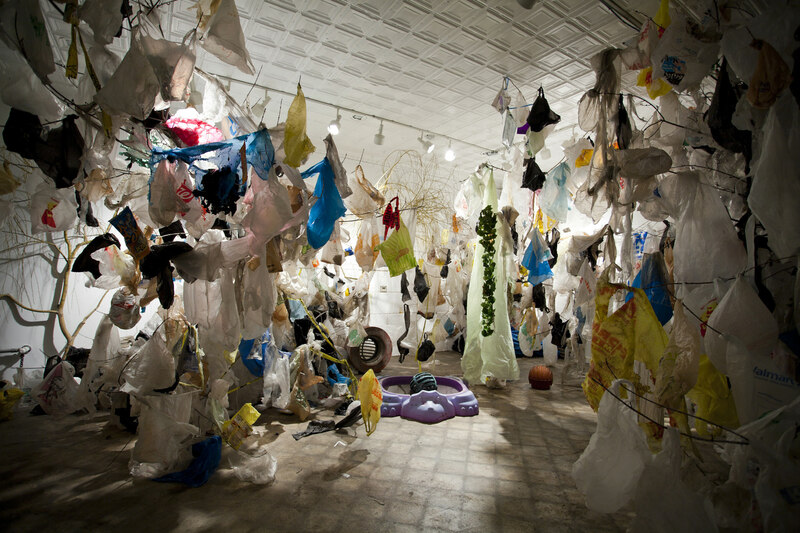 Over the next several days, Hocking expanded his work to a several mile radius collecting, he estimates, over a thousand small plastic shopping bags. Tartarus consists of these bags, variously torn and tainted with a mixture of dirt, germs and toxins (urine, sludge, gravel, gas, grass, mud) and a few other types of sacks and items he collected or cleaned up, dangling, like leaves, from willow tree branches and ghetto palm trees. On the gallery floor, “playground” type objects (a plastic baby pool and assorted ball-like sculptures, cast from spherical sewer grates) reside. The resulting exhibition reads as some sort of apocalyptic yet enchanting forest one might find in a postmodern fairy tale. There is no escaping the amount of time and labor the artist spent with this waste, not only gathering it but patiently, carefully, hanging each piece of litter from the tree branches. It was impossible during the crowded opening for visitors to avoid serious physical contact with the trees/trash that overtook the space, driving home the point that, for better or worse, we are all in this heap together (I overheard someone praise the show but say he thought he was allergic to it). There is a light majesty to Hocking’s constructions, grimy, sickening and polluted as they might be. He does not come down definitively to say what he thinks of Detroit and its future but with Tartarus, the artist and his hometown, to paraphrase Ring Lardner, give each other a smile with a future in it.